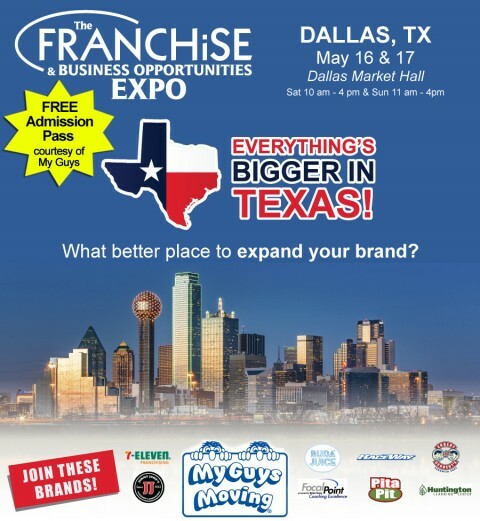 For 2 Days Only – Join My Guys Moving & Storage at the Largest Franchise Show in Dallas on May 16-17, 2015 at Dallas Market Hall, North Hall where you can see all your business ownership opportunities in one location. Visit us at Booth#303 and we’ll give you a Free Gift! Get your Free Admission Pass. Meet Face to Face with Successful Franchises & Businesses looking for Franchisees. Owning Your Own Business Can Be Easy and Affordable, Learn more at the Franchise Expo. Representatives from the Hottest Money Making Opportunities from across the Country. Explore both Full-time and Part-time business opportunities that you might not know about. Enjoy Seminars & Workshops on Starting Business the Smart Way. If you can’t make it to the franchise show, you can always contact us directly for your own My Guys Moving franchise! Our memorable brand gets the calls because it’s seen as friendly & approachable in an industry that is usually associated with stress and concern. People usually like the opportunity of living in a new place, but they rarely like the act of moving. That’s where our trained, professional movers come in! As part of the MY GUYS team, your guys will be trained in our two-story, simulated townhouse so they make their mistakes in our house, not your customers.